250 pages | 13 B/W Illus. Invoking the notion of ‘cosmopolitics’ from Bruno Latour and Isabelle Stengers, this volume shows how and why cities constitute privileged sites for studying the search for and composition of common worlds of cohabitation. A cosmopolitical approach to the city focuses on the multiple assemblages of human and nonhuman actors that constitute urban common worlds, and on the conflicts and compromises that arise among different ways of assembling the city. It brings into view how urban worlds are always in the process of being subtly transformed, destabilized, decentred, questioned, criticized, or even destroyed. As such, it opens up novel questions as to the gradual and contested composition of urban life, thereby forcing us to pay more explicit attention to the politics of urban assemblages. 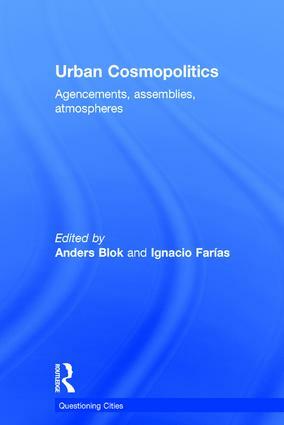 Focusing on changing sanitation infrastructures and practices, emerging forms of urban activism, processes of economic restructuring, transformations of the built environment, changing politics of expert-based urban planning, as well as novel practices for navigating the urban everyday, the contributions gathered in this volume explore different conceptual and empirical configurations of urban cosmopolitics: agencements, assemblies, atmospheres. Taken together, the volume thus aims at introducing and specifying a novel research program for rethinking urban studies and politics, in ways that remain sensitive to the multiple agencies, materialities, concerns and publics that constitute any urban situation. Urban Cosmopolitics offers a new way of thinking and doing urban politics. This theoretically bold and empirically rich collection shows that urban infrastructures and technologies are so much more than the supporting context for urban society and politics, they animate social life and activate political interest. Urban Cosmopolitics showcases the relevance of pragmatist and actor-network inspired approaches to understanding the most complex, multivariate, spatially extensive of socio-material assemblages – the city. It is a collection of essays that offers novel concepts for understanding the effects of urban technologies and expertise, as well as templates for alternative visions for assembling and enacting urban worlds. The appearances of the urban are insufficient to knowing how to engage the sheer multiplicity of causation at work in how the urban takes place. Cities are full of relations among forces and things that have no concern for maintaining any identity and meaning whatsoever and go beyond any agenda. But as this collection of writings orchestrated by Blok and Farías demonstrate, we can more judiciously remake ourselves as urban in the ways in which we co-exist and co-create with forces and things we can only fractionally know. And this entails a politics distributed across different domains, devices, entities and experiments, which alters the imagination of the urban as that which aims for continuous human transformation. Through specific engagements with new forms of urban activism, infrastructure, economy, everyday practices, built environments and planning practices, Urban Cosmopolitics vitally demonstrates new ethical practices of recomposing a common world among the many forms of agency, objects, infrastructures and collectivities alongside us. Anders Blok is Associate Professor in the Department of Sociology, University of Copenhagen, Denmark, and co-author of Bruno Latour: Hybrid Thoughts in a Hybrid World (Routledge, 2011). Ignacio Farías is Assistant Professor in the Munich Center for Technology in Society and the Faculty of Architecture at the Technische Universität, München, Germany. He is co-editor of Urban Assemblages: How Actor-Network Changes Urban Studies (Routledge, 2009).